I don’t recall being a picky eater as a child, but one food I could barely stomach was lima beans. The smell, the texture, the taste, even the look of them, really didn’t sit well with me. I know I’m not alone in this sentiment. Lima beans are a popular thing to hate, and I have avoided them ever since I was old enough to decide what was allowed on my plate. To be fair, the only lima beans I remember trying were the ones included in the familiar bag of frozen mixed vegetables, which might explain why I didn’t like them. But little did I know there is another reason to avoid them – lima beans are poisonous. That’s a strong statement. 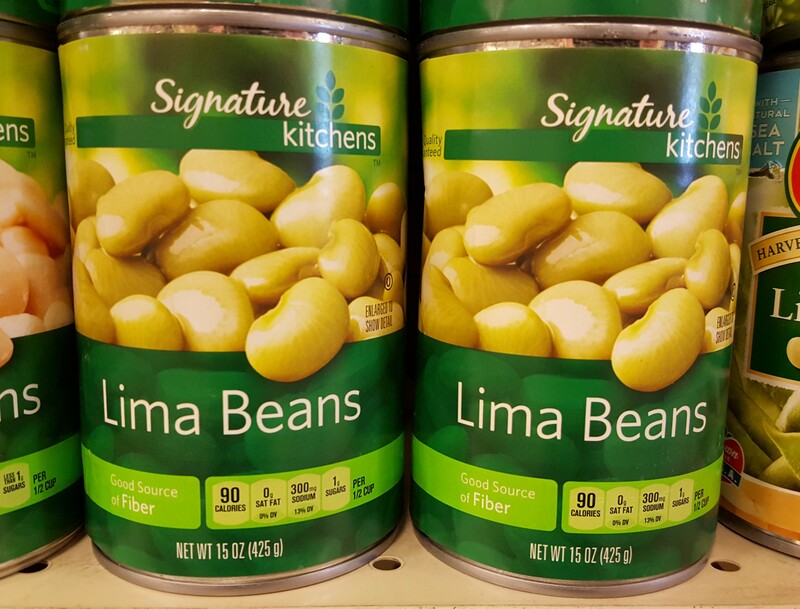 In case you’ve eaten lima beans recently or are about to, I should ease your concerns by telling you that you have little to worry about. Commonly cultivated lima beans are perfectly safe to eat as long as they are cooked properly, and even if they are eaten raw in small doses, they are not likely to hurt you. But again, why are you eating lima beans? They’re gross. Phaseolus lunatus – commonly known as lima bean as well as a number of other common names – is in the legume family (Fabaceae) and is native to tropical America. It is a perennial, twining vine that reaches up to 5 meters. It has trifoliate leaves that are alternately arranged, and its flowers are typically white, pink, or purple and similar in appearance to pea flowers and other flowers in the legume family. 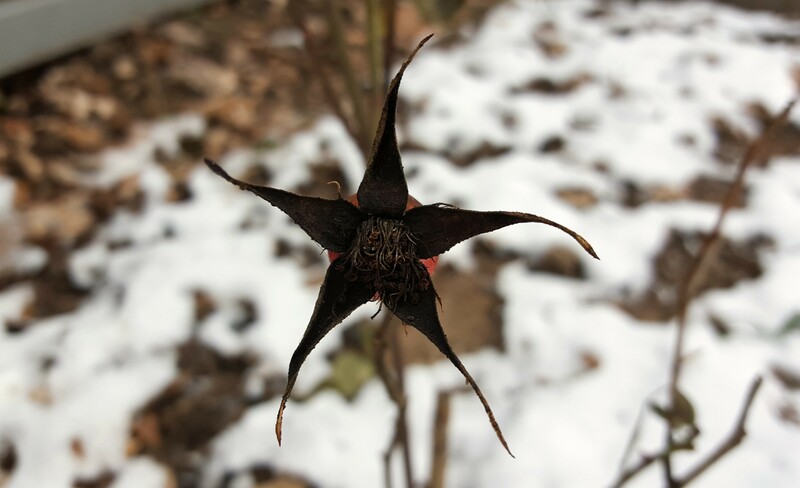 The fruits are hairy, flat, 5 – 10 cm long, and often in the shape of a half moon. 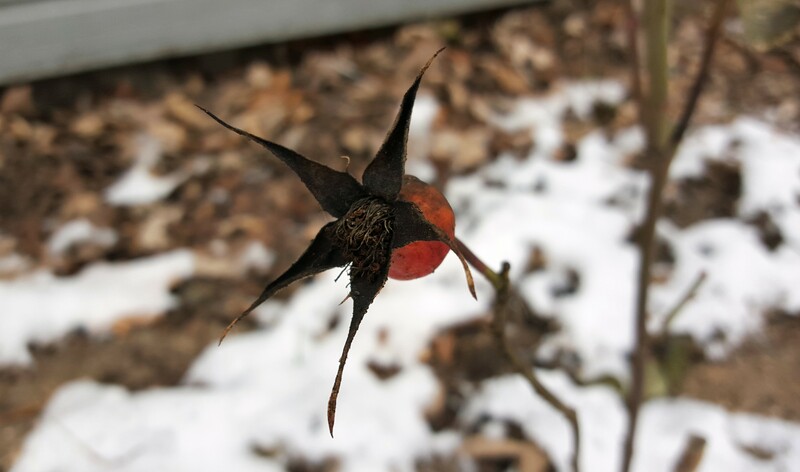 The seeds are usually smooth and flat, but are highly variable in color, appearing in white, off-white, olive, brown, red, black, and mottled. P. lunatus experienced at least two major domestication events – one in the Andes around 4ooo years ago and the other in Central America more than 1000 years ago. Studies have found that the first event yielded large seeded varieties, and the second event produced medium to small seeded varieties. Wild types of P. lunatus have been given the variety name sylvester, and cultivated types are known as variety lunatus; however, these don’t appear to be accepted names by plant taxonomists and perhaps are just a way of distinguishing cultivated plants from plants growing in the wild, especially in places where P. lunatus has become naturalized such as Madagascar. Distinguishing wild types from cultivated types is important though, because wild types are potentially more poisonous. Lima bean, like several other plants we eat, contains compounds in its tissues that produce cyanide. These cyanide producing compounds are called cyanogenic glucosides and are present in many species of plants as a form of defense against herbivores. 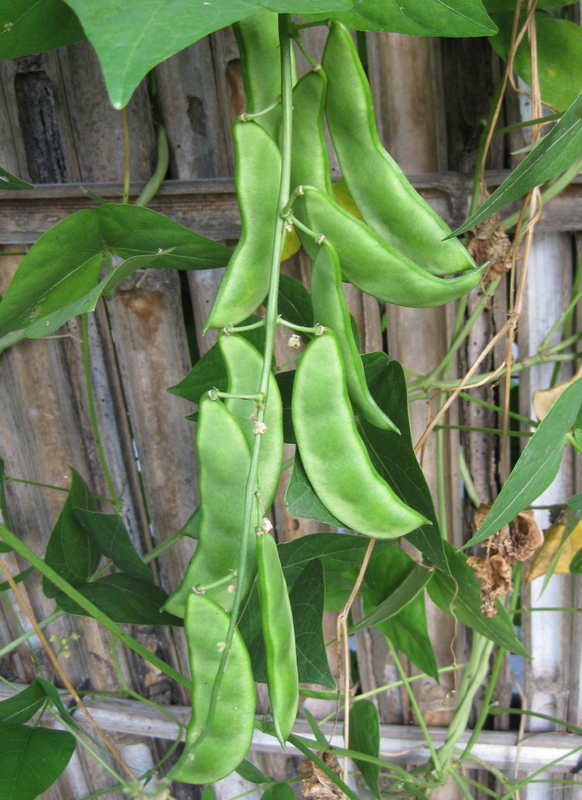 The predominant cyanogenic glucoside in lima beans is called linamarin, which is also present in cassava and flax. In order for lima beans to poison you, they must be chewed. Chewing brings linamarin and the enzymes that react with it together. Both compounds are present in the cells of lima beans, but they reside in different areas. Once they are brought together, a reaction ensues and hydrogen cyanide is produced. Because cyanide isn’t produced until after the plant is consumed, the symptoms of cyanide poisoning can take a little while to occur – often several hours. Cyanide poisoning is not a pretty thing. First comes sweating, abdominal pain, vomiting, and lethargy. If the poisoning is severe, coma, convulsions, and cardiovascular collapse can occur. There are treatments for cyanide poisoning, but if treatment comes too late or if the dose is large enough, death results. Cassava (Manihot esculenta) is particularly well known for its history of cyanide poisonings. It is a staple crop of people living in tropical areas of Africa and South America. Humans can readily metabolize small amounts of cyanide, and processes like crushing and rinsing, cooking, boiling, blanching, and fermenting render cassava safe to eat. However, consuming cassava that isn’t prepared properly on a consistent basis can result in chronic illnesses, such as konzo, which is a major concern among cultures in which cassava is an important food source. I guess I should reiterate at this point that most cultivated lima beans contain low (read “safe”) levels of cyanogenic glucosides and, particularly when cooked, are perfectly safe to eat. I’m still not totally convinced that I should eat them though. While researching this article I came across numerous sites claiming that lima beans are delicious while offering various recipes to prove it. I even came across this story in which a self-proclaimed “lima bean loather” was converted to the side of the lima bean lovers. I don’t fancy myself much of a cook, so I’m hesitant to attempt a lima bean laden recipe for fear that it will only make me hate them more. If anyone out there thinks they can convince me otherwise with their tasty creation, be my guest. 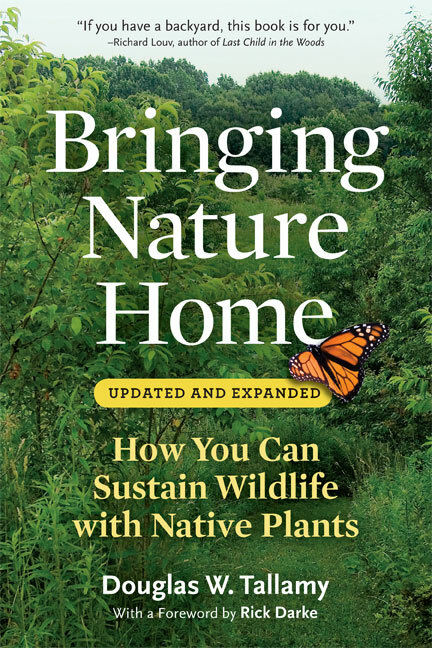 Since Bringing Nature Home by Douglas Tallamy was first published in 2007, it has quickly become somewhat of a “classic” to proponents of native plant gardening. As such a proponent, I figured I ought to put in my two cents. Full disclosure: this is less of a review and more of an outright endorsement. I’m fawning, really, and I’m not ashamed to admit it. A plant is considered native to an area if it shares a historical evolutionary relationship with the other organisms in that area. This evolutionary relationship is important because the interactions among organisms that developed over thousands, even millions, of years are what define a natural community. Thus, as Tallamy argues, “a plant can only function as a true ‘native’ while it is interacting with the community that historically helped shape it.” A garden designed to benefit wildlife and preserve biodiversity is most effective when it includes a high percentage of native plants because other species native to the area are already adapted to using them. Plants (and algae) are at the base of every food chain – the first trophic level – because they produce their own food using the sun’s energy. Organisms that are primarily herbivores are at the second trophic level, organisms that primarily consume herbivores are at the third trophic level, and so on. 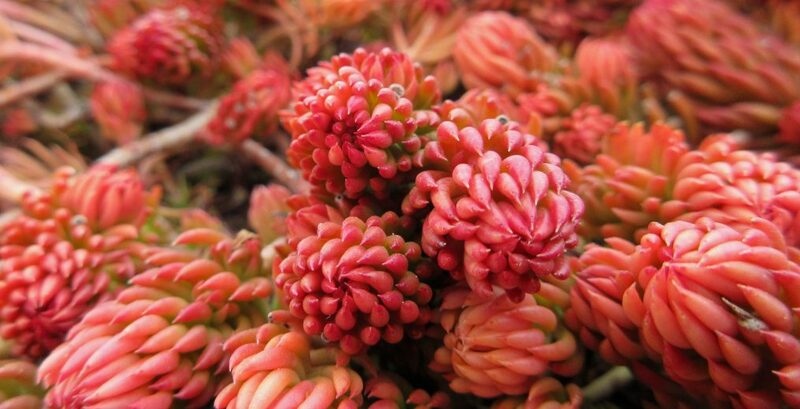 As plants have evolved they have developed numerous defenses to keep from being eaten. Herbivores that evolved along with those plants have evolved the ability to overcome those defenses. This is important because if herbivores can’t eat the plants then they can’t survive, and if they don’t survive then there will be little food for organisms at higher trophic levels. The most important herbivores are insects simply because they are so abundant and diverse and, thus, are a major food source for species at higher trophic levels. 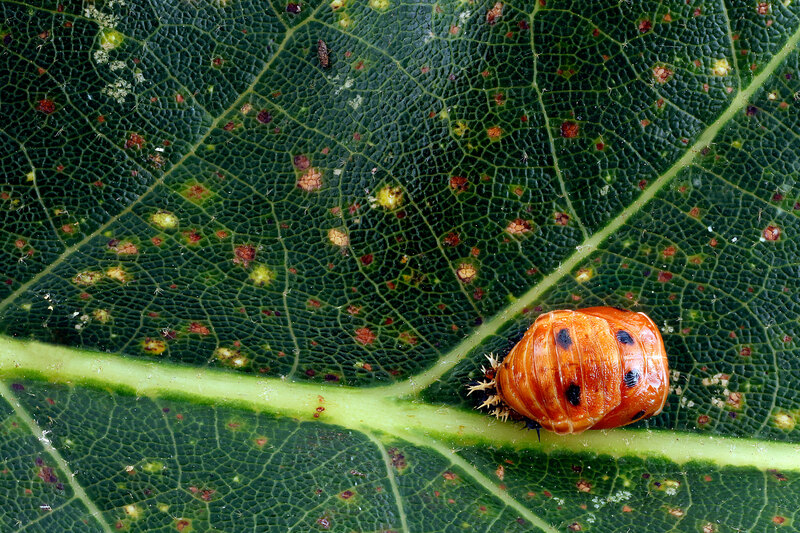 The problem is that, as Tallamy learned, “most insect herbivores can only eat plants with which they share an evolutionary history.” Insects are specialized as to which plants they can eat because they have adapted ways to overcome the defenses that said plants have developed to keep things from eating them. Healthy, abundant, and diverse insect populations support biodiversity at higher trophic levels, but such insect populations won’t exist without a diverse community of native plants with which the insects share an evolutionary history. That is essentially the thesis of Tallamy’s book. In a chapter entitled “Why Can’t Insects Eat Alien Plants?” Tallamy expounds on the specialized relationships between plants and insects that have developed over millennia. Plants introduced from other areas have not formed such relationships and are thus used to a much lesser degree than their native counterparts. Research concerning this topic was scarce at the time this book was published, but among other studies, Tallamy cites preliminary data from a study he carried out on his property. The study compared the insect herbivore biomass and diversity found on four common native plants vs. five common invasive plants. The native plants produced 4 times more herbivore biomass and supported 3.2 times as many herbivore species compared to the invasive plants. He also determined that the insects using the alien plants were generalists, and when he eliminated specialists from the study he still found that natives supported twice as much generalist biomass. Apart from native plants and insects, Tallamy frames much of his argument around birds. Birds have been greatly impacted by humans. Their populations are shrinking at an alarming rate, and many species are threatened with extinction. Tallamy asserts, “We know most about the effects of habitat loss from studies of birds.” We have destroyed their homes and taken away their food and “filled their world with dangerous obstacles.” Efforts to improve habitat for birds will simultaneously improve habitat for other organisms. Most bird species rely on insects during reproduction in order to feed themselves and their young. Reducing insect populations by filling our landscapes largely with alien plant species threatens the survival of many bird species. 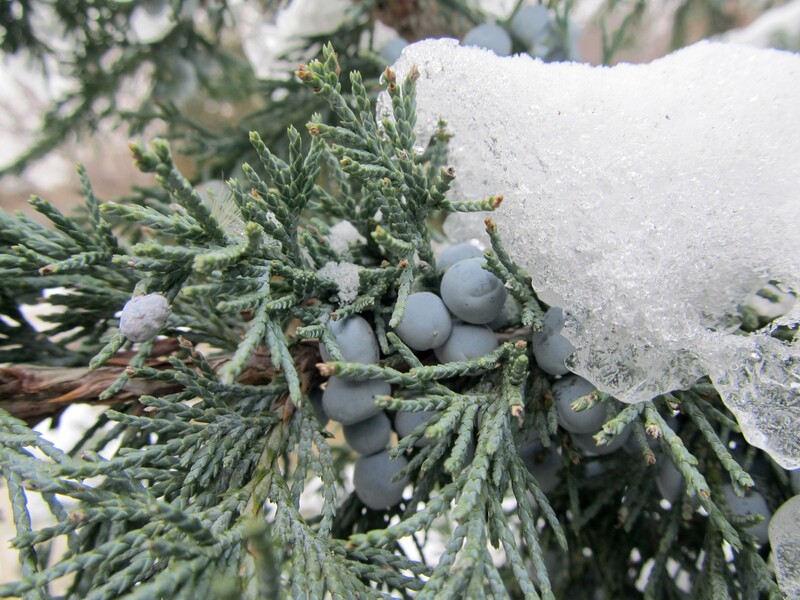 In the chapters “What Should I Plant?” and “What Does Bird Food Look Like?,” Tallamy first profiles 20 groups of native trees and shrubs that excel at supporting populations of native arthropods and then describes a whole host of arthropods and arthropod predators that birds love to eat. Tallamy’s fascinating descriptions of the insects, their life cycles, and their behaviors alone make this book worth reading. Other chapters that are well worth a look are “Who Cares about Biodiversity?” in which Tallamy explains why biodiversity is so essential for life on Earth, and “The Cost of Using Alien Ornamentals” in which Tallamy outlines a number of ways that our obsession with exotic plants has caused problems for us and for natural areas. Convincing people to switch to using native plants isn’t always easy, especially if your argument involves providing habitat for larger and more diverse populations of insects. For those who are not fans of insects, Tallamy explains that “a mere 1%” of the 4 million insect species on Earth “interact with humans in negative ways.” The majority are not pests. It is also important to understand that even humans “need healthy insect populations to ensure our own survival.” Tallamy also offers some suggestions on how to design and manage an appealing garden using native plants. A more recent book Tallamy co-authored with fellow native plant gardening advocate Rick Darke called The Living Landscape expands on this theme, although neither book claims to be a how to guide. Interested in writing a book review for Awkward Botany? Or helping out in another way? Find out how. For three years now I have been maintaining this blog solo. This doesn’t always have to be so. A single individual with truncated resources cannot possibly do it all. I can and will continue to write posts on a regular basis for the foreseeable future, but – at least in my mind – Awkward Botany can and should be so much more. Creating a space where novices, amateurs, and experts alike can share in the discovery, exploration, and celebration of plants and plant ecology. I say “to be determined” because these are ideas in embryo. They will mature in time; however, without outside help, they are doomed to proceed at a snail’s pace. Perhaps this is where you come in? If you like what you see here, and the idea of Awkward Botany growing into something greater interests you in any way, then there are various ways in which you can help make this happen. I have a put a few feelers out there for guest writers, but I haven’t had anyone bite yet. If you love plants and want to write about them, let me know. True, I am going to be a little picky about what I publish here, but I’m sure we can work something out. Are you a professional or amateur graphic designer? Would you like more exposure or experience? Awkward Botany needs a logo. Obviously – at this point – I don’t have the money to pay anyone for their design work. But I will happily shout from the rooftops the name of the person/company that designs a logo for me. If this sounds like a job for you, let me know. I have found that one of the most time consuming things about composing a blog post is searching for just the right images to accompany the writing. Sure, good writing stands alone, but images help break up the text and add context to what the writing is all about. Not only am I a bumbling, untrained photographer, but I also have limited access to many of the plants and other things that I write about. There are open source images available online, but they are also quite limited, and sifting through them for just the right image often ends unfruitful or in settling for a less than ideal photo. If you enjoy photographing or drawing plants, please get in touch. Again, I have no money to offer, but I will always give credit where credit is due, and I am more than happy to sing praises to your name in all outlets available. I am especially looking for illustrators/illustrations for Awkward Botany and Awkward Botany related projects. Infographics would be great as well. Any graphic designers out there who would like to work with me on designing such things for Awkaward Botany and beyond, please get in touch. I have dreams of taking Awkward Botany beyond the written word. I don’t want to start a podcast, but it would be great to do some interviews and have the audio clips available for people to listen to. Video would also be fun. If you have experience creating audio and/or video and would like to offer advice or assistance, please let me know. Donate Old Textbooks, Field Guides, Floras, and Scientific Journals. Did you take a course in botany? Do you still have your textbook? If you’d like to get rid of it, consider sending it my way. Same goes for any entomology or ecology related courses. I’d be happy to take textbooks off your hands, as well as field guides, floras, and old copies of scientific journals relating to plants, entomology, pollination, ecology, invasion biology, etc. You can mail them cheaply by requesting the USPS media rate. Contact me via the contact form for my mailing address. Donate Your Hard Earned Money. I certainly don’t expect anyone to send money without receiving anything in return. BUT, if you do happen to have a few dollars burning a hole in your pocket and you need someplace for them to go, I would be happy to have them. Rest assured your dollars and cents will be put to a good cause. Lack of funds really limits the progress of this blog, so any additional funding is greatly appreciated. As I am able, I hope to reward those who donate. I also plan to pay forward a percentage of the donated money I receive to Planting Science – an organization that connects scientists with students in order to advance scientific training and literacy among the younger generation. I also intend to be transparent concerning any and all donations I receive. If such a thing interests you, please consider sending a few bucks via the following links or the mailing address above. If a cash money donation doesn’t suit you, consider sending Awkward Botany something from it’s Amazon Wish List. The items on this list include resources that will help advance the mission of Awkward Botany. Probably the simplest thing you can do to support Awkward Botany (and one of the most effective) is read, follow, and share. Awkward Botany is on Twitter and Tumblr. Follow me at either or both of those locations if you feel so inclined. If you like what you see here, share it with your friends via whatever social media outlet you prefer and/or word of mouth. Five gold stars if you do. If you are interested in assisting Awkward Botany in any of the above ways – or if you have some ideas of your own – please contact me via the Contact page or via snail mail (!) at the address above. There are likely many other ways that you can help, so this post will be updated frequently as such needs are articulated. It will find a permanent home in the “About” tab at the top of the page. Raise your glass. 2015 has come to a close, and Awkward Botany is turning three. Two great reasons to celebrate. I started the year with the goal of posting at least once per week. Consider that goal accomplished, with a couple of bonus posts thrown in for good measure. I had also deemed 2015 the “Year of Pollination.” The underlying purpose was to teach myself more about pollinators and pollination while also sharing my interest in pollination biology with the wider world. That endeavor yielded 17 posts. There is still so much to learn, but we are making some headway. I started two new series of posts (Poisonous Plants and Botany in Popular Culture) and I continued with two others (Ethnobotany and Drought Tolerant Plants). I also went on a couple of field trips and wrote a few book reviews. All of that is reflected below in “Table of Contents” fashion. 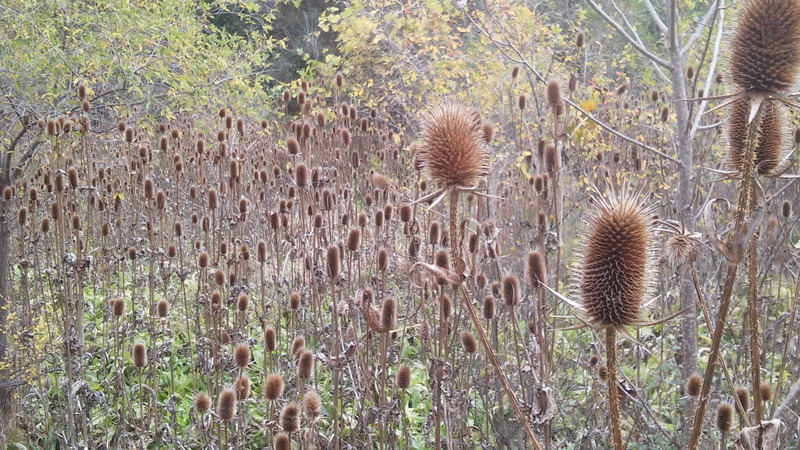 Going forward, I will continue to post regularly – as there is no shortage of plant-related things to write about – but I will likely take a week off here and there. I have other projects in mind – some related to Awkward Botany, some not – that will certainly demand much of my attention and time. I have some big ideas for Awkward Botany and beyond, and I will share those with the wide world in due time. For now, I would just like to say thanks all for reading, for commenting, and for sharing Awkward Botany with your friends. Overall, it has been a great year here at Awkward Botany headquarters, and I have you to thank for that. I feel privileged to be part of a community that is infatuated with plants and is fascinated by the natural world. Good riddance to 2015. It was good, but it gets better. Now we look ahead to 2016. May it be filled with peace, love, and botany.